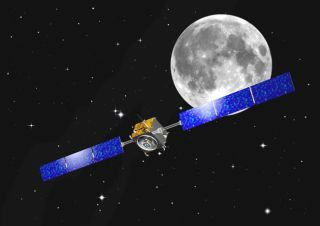 European Space Agencyâ€™s (ESA) SMART-1 probe used an ion drive to reach the moon and purposely crashed into the lunar surface to end its mission in September 2006. PARIS - The German government, in a move certain to raise eyebrows among the country's European partners, is proposing to build its own lunar orbiter with all-German technology at a cost of up to 350 million euros ($508 million), the chairman of the German space agency said Nov. 8. Johann-Dietrich Woerner said the mission, called Lunar Exploration Orbiter, or LEO, would showcase German technological expertise in radar and other high-resolution imaging, gravity measurement and laser communications. It could be launched in 2012 and would orbit at an altitude of about 31 miles (50 kilometers) over the lunar surface. Addressing a press briefing in Berlin during an international conference on space exploration, Woerner said that while the LEO project has the backing of German Deputy Economics Minister Peter Hintze, who is also the country's aerospace coordinator, it has not yet been approved by German authorities. Hintze also addressed the Berlin conference and endorsed the LEO project. Germany is the second-largest contributor to the European Space Agency (ESA), behind France and ahead of Italy. ESA is assembling its own mid- and long-term exploration policy, with Mars as the focus and possibly including a secondary role in a NASA-led return to the Moon with astronauts. ESA's SMART-1 lunar orbiter completed its mission in September 2006 and the agency has no plans for a follow-up orbiter. ESA in 2005 won approval from its governments for a 650 million-euro ($954 million) Mars lander called ExoMars to be launched in 2013. More recently, the agency has added more scientific instruments to the ExoMars lander and also has considered a Mars orbiter to provide communications links between the lander and ground controllers. But the new ExoMars mission carries an estimated price tag of about 1 billion euros ($1.46 billion). ESA is trying to secure the remaining 350 million euros ($513 million) from its member governments but as yet has no commitments. ESA Director-General Jean-Jacques Dordain told the press briefing that the agency would await a November 2008 meeting of ESA government ministers before deciding the exact configuration of ExoMars, and whether NASA and the Russian Space Agency will contribute instruments. The same holds for ExoMars' Russian-supplied nuclear heaters, which Dordain said were indispensable for the mission because Europe does not have its own radioisotope power source designed for space missions. But the nuclear heaters would require investment in safety and security procedures at Europe's Guiana Space Center launch site in French Guiana - one reason why ESA is considering launching ExoMars on Russia's Proton vehicle as part of a barter arrangement. A decision on whether to use Europe's Ariane 5 rocket or the Proton also will await the November 2008 ministers' meeting, Dordain said. With Europe's own exploration package still struggling for funds, some ESA and European government officials have questioned the wisdom of Germany's solo lunar orbiter and a similar idea being considered by the British government. These officials said ESA already is investing in lunar orbiters launched or planned by Japan, China and India - in addition to Europe's SMART-1 mission. Woerner said the LEO lunar orbiter should not be viewed as a project that is competing for funds that might otherwise be used in ESA. "The budget sources are different," he said, adding that Germany already contributes a higher percentage of its total space budget to ESA than its major European partners do.